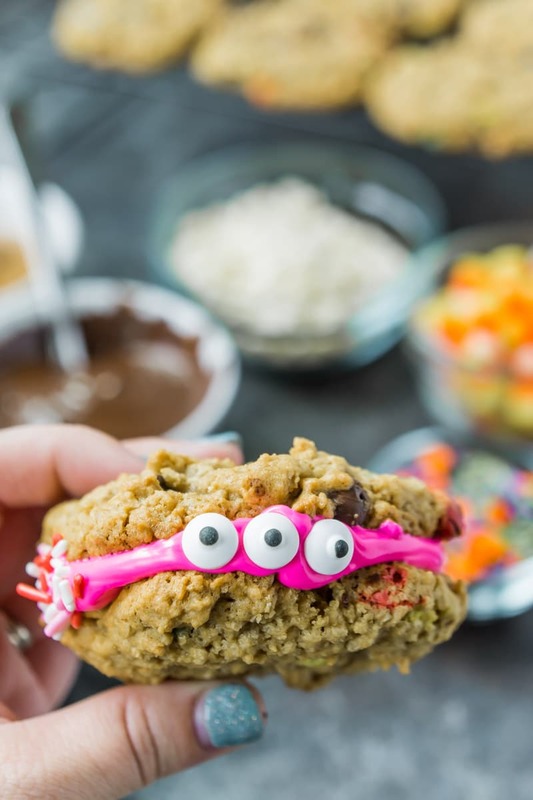 These monster cookie sandwiches are the perfect Halloween treat for kids and adults alike! And they’re even better when paired with some chocolate milk turned into monster milk with free printable monster drink labels! While this post is sponsored as part of The National Milk Life Campaign, all ideas and opinions are 100% honest and my own. There’s just something that I adore about Halloween and unlike my friend Tania who loves her costumes, I’m not really a huge dress up person. I mean I am going to wear the DIY superhero costumes I made (or maybe the sweatshirt I made for the Not So Scary Halloween Party), but costumes aren’t really my thing. My thing is food. All of the cute food. Give me all of the candy eyeballs, really just candy period. I don’t want anything gross but things like these monster cinnamon rolls, and I’m all in. My 5-year-old is just as obsessed with cute food and candy eyeballs as I am, so I thought it’d be fun to make a special like Halloween treat just for him (and me!) – milk and cookies. But not just any milk and cookies – monster milk and monster cookies. And not just monster cookies – monster cookie sandwiches, because everyone knows a cookie sandwich is better than a cookie all by itself. Add candy eyeballs, and it’s a Halloween home run! 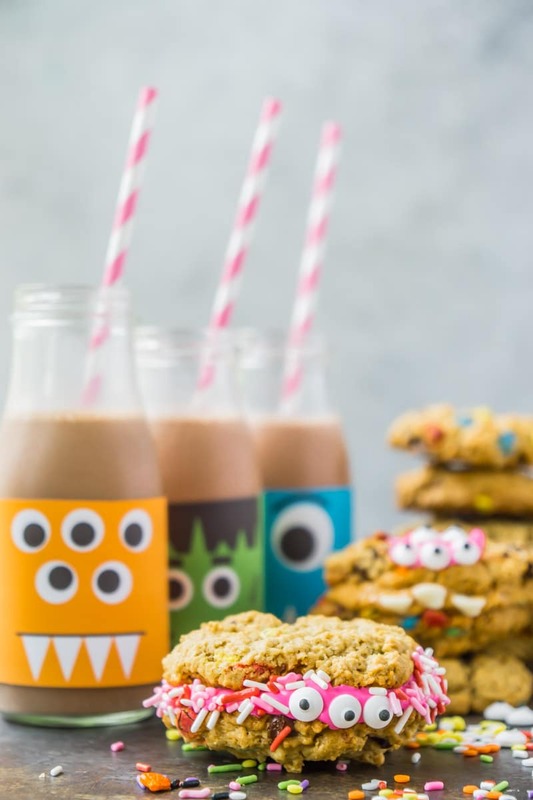 And if you don’t want to stop there – keep the monster theme going by playing a friendly game of Monster Mash bingo after you enjoy your monster cookies and milk! I’ll get to the monster cookie sandwiches in a minute but first let’s start with the monster milk. Since this is supposed to be more of a treat, I decided to go with chocolate milk instead of regular milk. Going with chocolate instead of milk just makes these monsters feel a little bit more fun and you know I’m all about making life more fun! Even though chocolate milk feels more like a treat, I can still feel good about it being full of calcium and all of the other nutrients of classic milk. 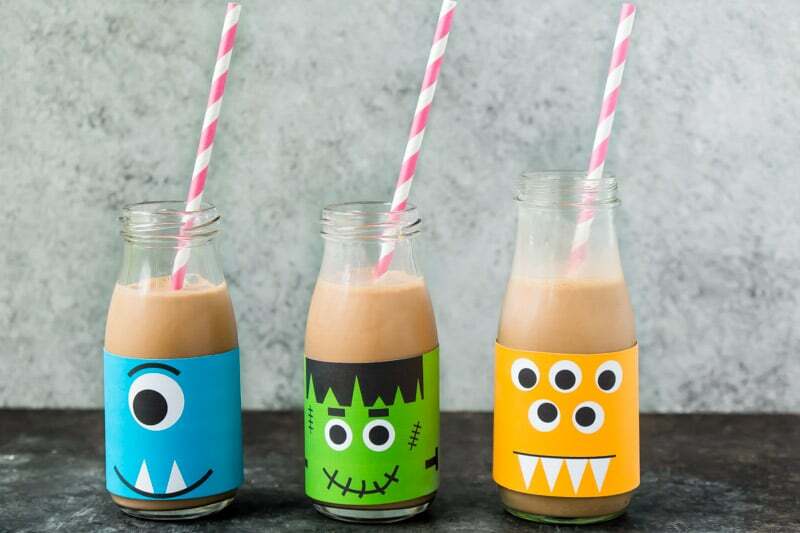 And chocolate milk has eight times more naturally occurring, high-quality protein than most almond or rice milks in every 8-ounce glass, so yeah – chocolate milk is the new official drink of Halloween, in our house anyway. And to be honest – it looks better as monster milk than white anyway. No vampire or ghost milk here! Don’t have chocolate milk at home? Visit Amazon Fresh to get it delivered today! 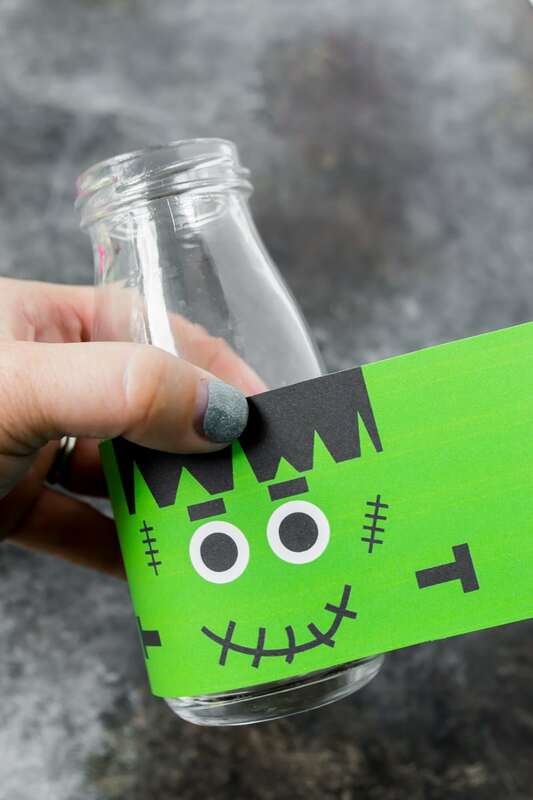 1 – Print out the monster labels on either full-sheet label paper or white card stock. Cut out the labels so there is no white showing on the labels. 2 – Place a piece of double-sided tape on the inside end of each of the labels. 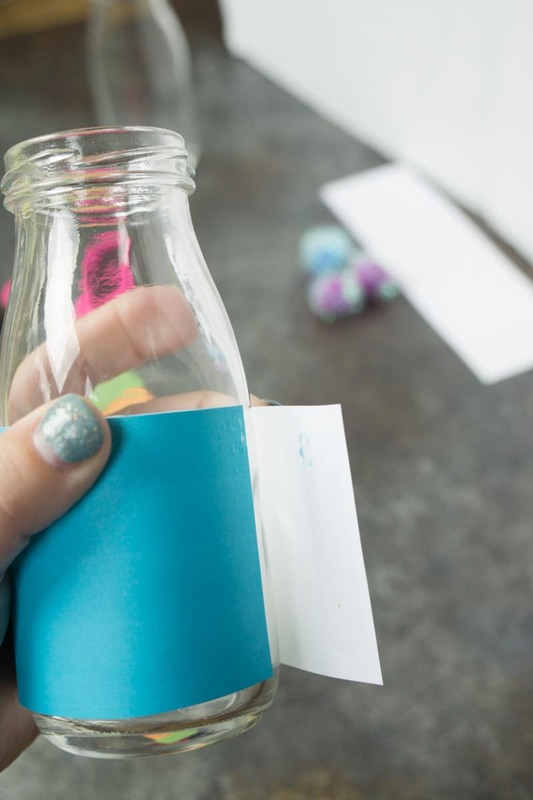 3 – Tape one side of the label onto the back of the bottle, wrap the label around the bottle, and secure by taping the other end on top of the label on the back. 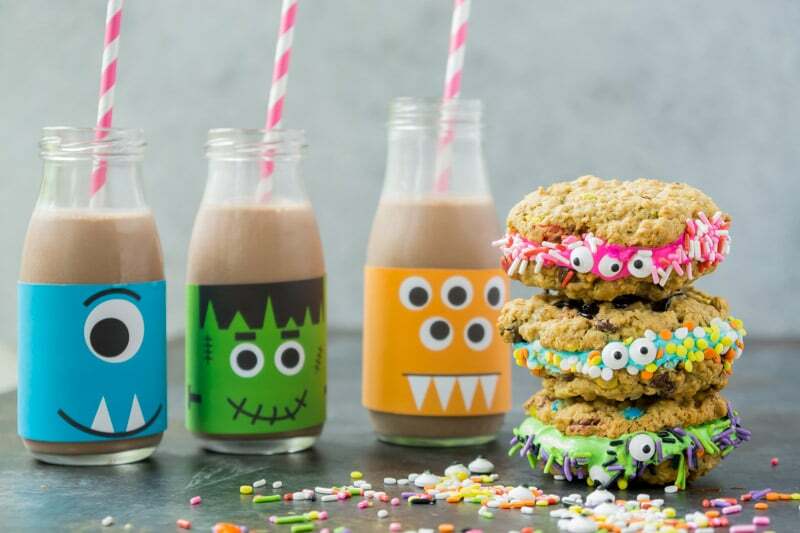 4 – Add chocolate milk, a striped straw, and some delicious monster cookies sandwiches! 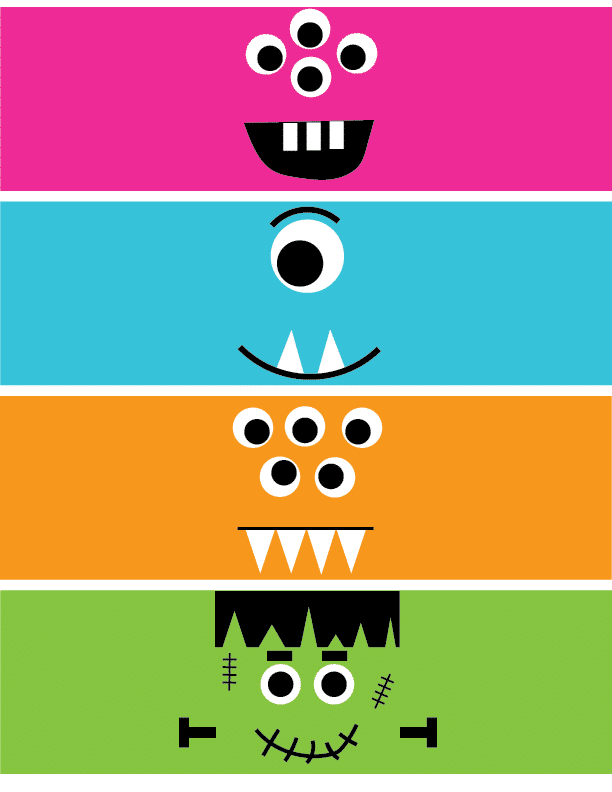 Enter your first name and email address below to get the downloadable monster milk labels. If you don’t see the form, click here to get to it. I’ve seen tons of monster treats out there, but I thought monster cookies would be perfect for these cookie sandwiches because well monster cookies are I mean – they’re monsters. 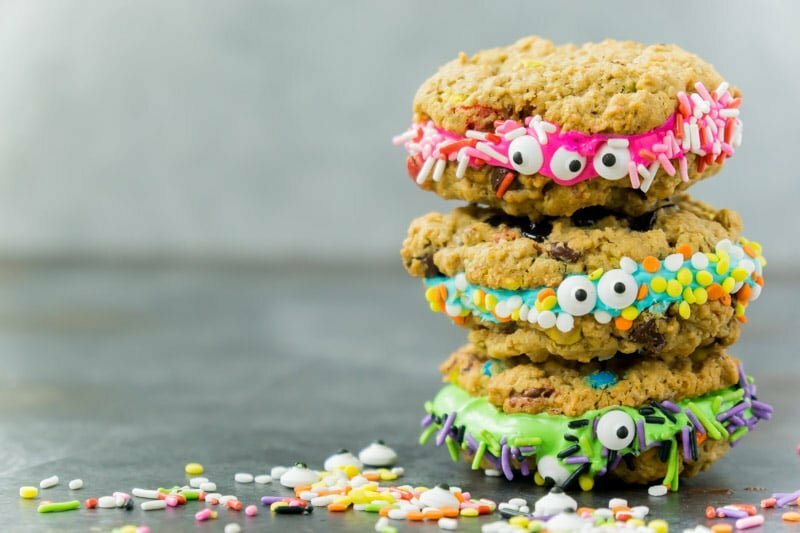 There’s not really a recipe for these monster cookie sandwiches because the idea is for you to be as creative as possible. I actually recommend getting your kids involved and letting them put together their own! I’m going to do a walk-through of how I made them and some of my suggested toppings but have fun with it. 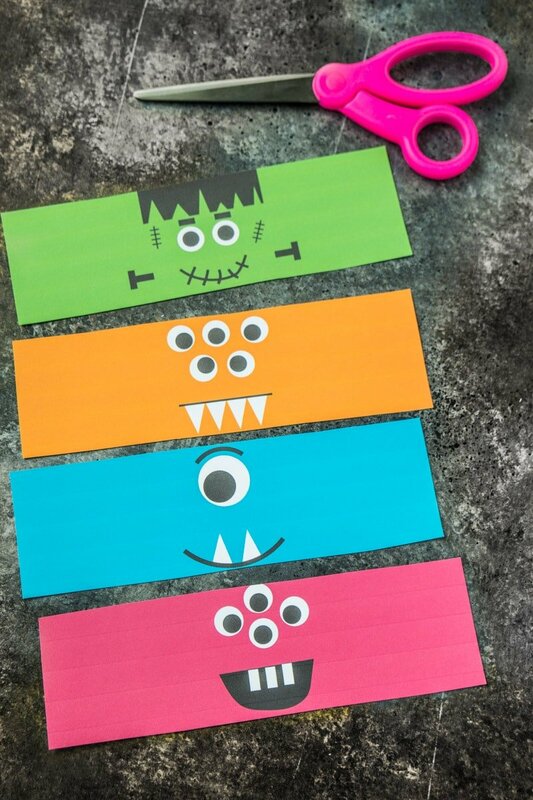 Make your own favorite Halloween monsters with your own favorite toppings and flavors! 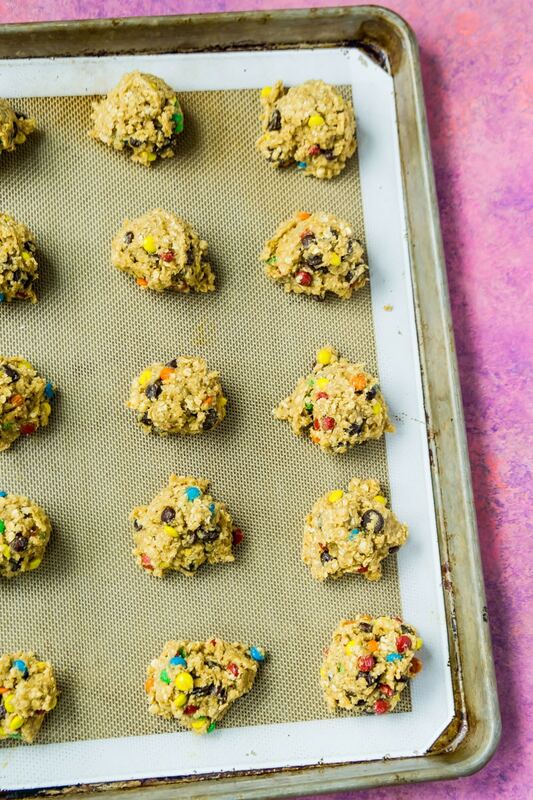 1 – Bake your monster cookies. I used this delicious recipe from Shugary Sweets but this less traditional recipe from Sugar & Soul also sounded great if you like coconut! Make sure to use a 2TBS cookie scoop to get cookies that are about the same size – essential for making cookie sandwiches! 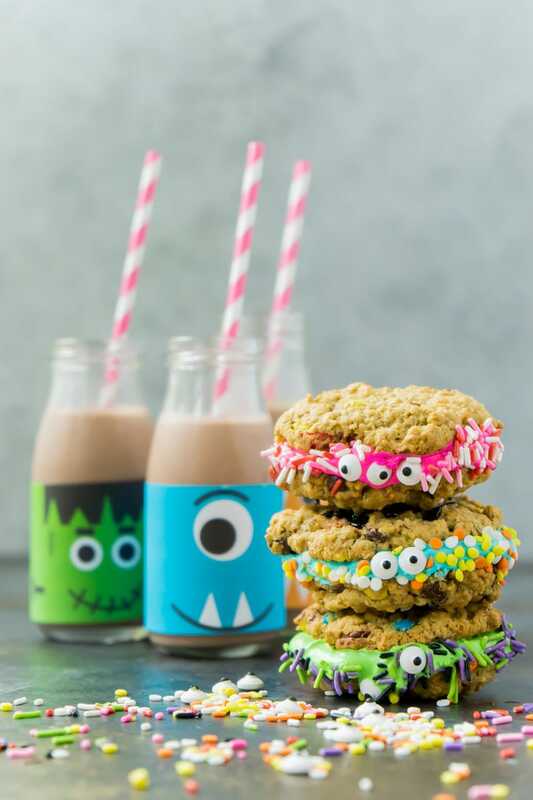 2- While your cookies are baking, put together your very own monster cookie sandwich bar with all of the ingredients for people to make their own monster. Kids especially will love getting to be creative with sprinkles, eyeballs, and teeth! 3 – To make the cookie sandwiches, simply place some filling in between two similar sized monster cookies and smoosh together to press the filling to the side. 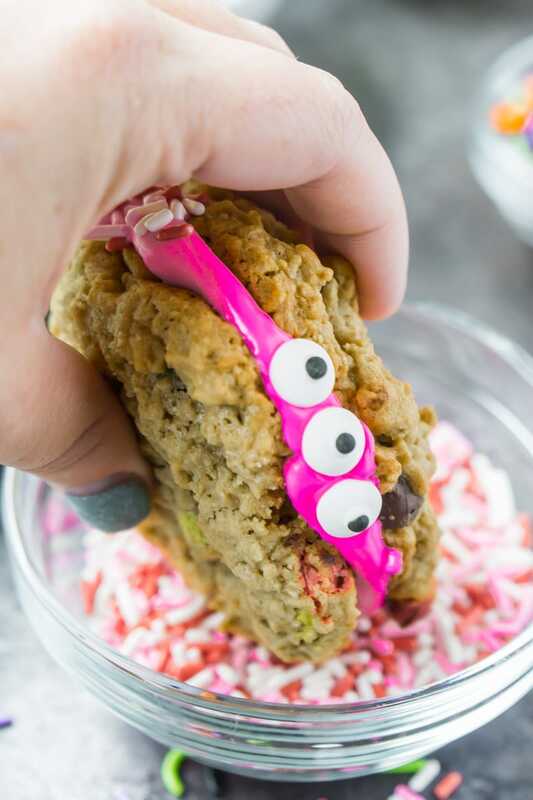 Then dip the cookie sandwich in sprinkles and add monster eyes and other embellishments. Or do it in reverse – add eyes and embellishments first then add sprinkles. 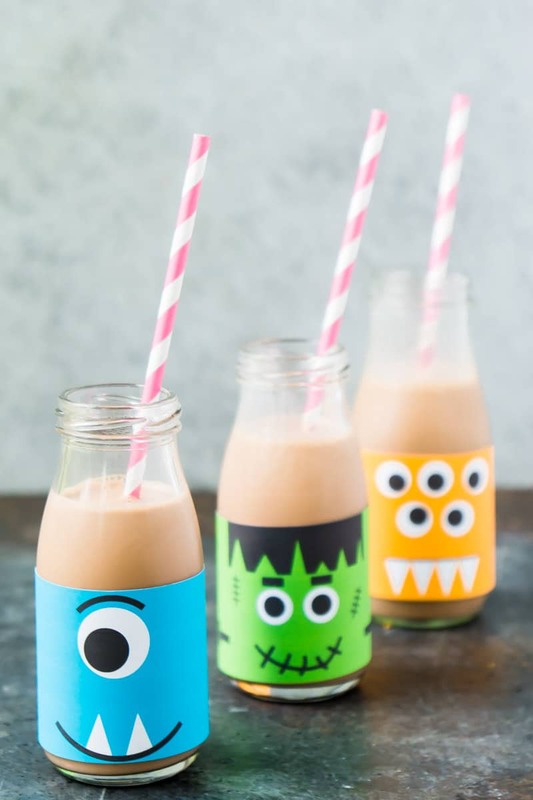 Enjoy with a cold glass of chocolate monster milk for one spooktacular treat! You could even make it into a competition, kind of like a gingerbread house making competition – see who can get the most creative with the supplies provided! 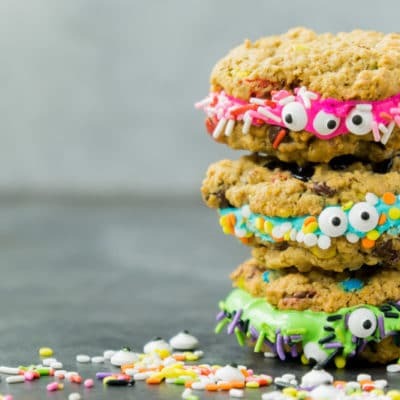 Easy monster cookie sandwiches made up of monster cookies, delicious fillings, and topped with candy eyeballs and sprinkles! The perfect Halloween treat for the ultimate monster mash! Place filling of your choice between two similar sized monster cookies and smash together carefully. 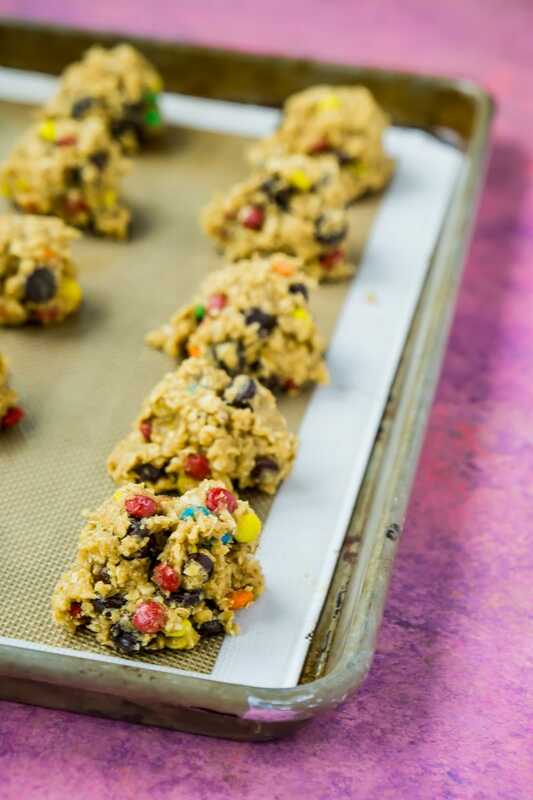 Dip edges of cookie into sprinkles or sprinkle sprinkles on all edges of cookie. 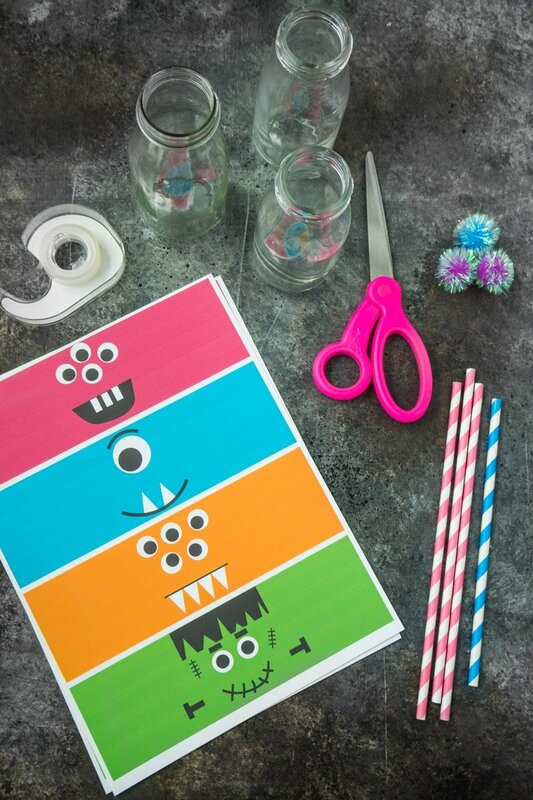 Add candy eyeballs, more sprinkles, and other candy or embellishments to make monsters. Enjoy with chocolate milk to wash them down! This recipe is designed for you to create the monsters of your choosing. 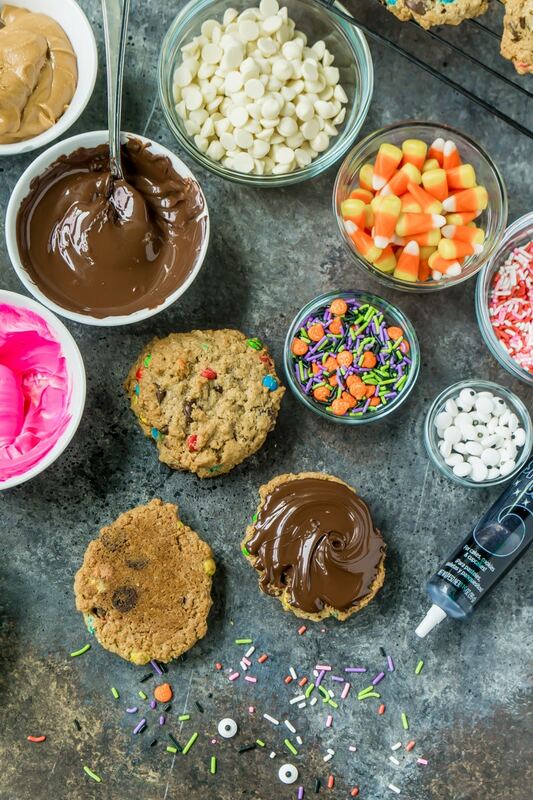 Pick a filling and the decorations you want then get mashing to create the best monster cookie sandwiches ever. Don’t forget to pin these monster milk and cookies for later!